While the calendar doesn’t say it’s officially fall, it’s obvious that things are changing. Our daylight hours are growing shorter, the crowds of summer visitors have thinned, kids are back in school, and for many Alaskans it’s time to take to the field in pursuit of a moose or caribou. And while the fishing frenzy that often accompanies summer days might have waned, there are still many opportunities to keep your fishing gear at the ready. Fall is often the time for Alaskans to fish without the crowds, with just the sounds of nature to keep them company. In many areas, coho salmon are still streaming into rivers and streams, keeping anglers on their toes, waiting for one to aggressively take their bait or lure. And don’t forget about the hundreds of stocked lakes, where you can often find families enjoying a day, looking to bring back fish for dinner. Bottomline: Don’t put away your fishing poles just yet. The fun continues. It’s just outside your door. The results are in. 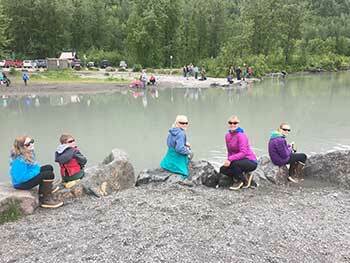 The Eklutna Tailrace has been ranked as the Nation’s top Mom-Approved fishing location. The Recreational Boating and Fishing Foundation (RBFF) conducted a six-week nationwide contest asking for people to rank the top Mom-Approved fishing location in each state. Voters from Alaska banded together and put the Eklutna Tailrace in the top spot with over 5,000 votes. The second-place finisher was Cumberland Lake in Kentucky. RBFF is a nonprofit organization whose mission is to increase participation in recreational angling and boating, thereby protecting and restoring the nation's aquatic natural resources. Regulation Photo Contest: Submit Pictures of Youth Fishing! Each year the Division of Sport Fish publishes four regulation summary booklets: Northern, Southcentral, Southeast, and Southwest, each with a cover photograph of a young angler and their catch. 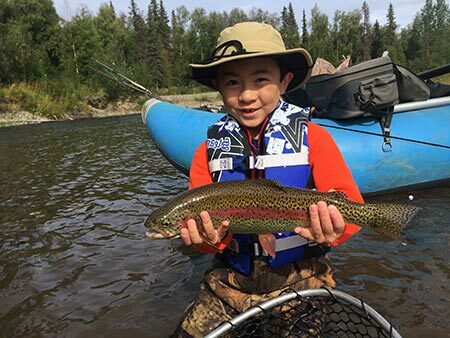 It's now time to submit your best photo of a favorite youngster showing off why they love to fish in Alaska. Check out our website for all the required information we will need to consider your photograph for the 2019 regulation summary booklet cover photo contest. Are you are looking for some fall fishing fun or need to stock up the freezer for the winter months? September is prime time to target coho salmon in the Ketchikan area. Coho salmon, also known as silver salmon, are abundant and aggressive, making them one of the most exciting and catchable of the salmon species. Known to put up a good fight and dramatic show, there’s nothing quite like the adrenaline rush from reeling in a hard-hitting, scrappy silver. 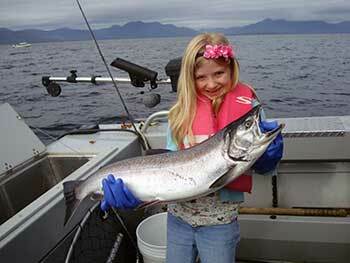 Coho salmon are found throughout the marine waters of the Ketchikan area from July through October. The best fishing for fall run coho salmon occurs from late August through early October with catch rates peaking in mid-September. Hatchery releases contribute significantly to the Ketchikan coho fishery thanks to a remote release at the Neets Bay Hatchery on the north end of town and a roadside release at Whitman Lake Hatchery on the south end of town. Fall run coho salmon are typically larger than summer run coho with an average size of 10-15 lbs., with some topping the scales at over 20 lbs. Anglers typically troll for coho salmon using flashers with herring, hoochies, and spoons. Coho are usually caught within 30 feet of the surface, but it is not uncommon to catch them deeper. Whether you are fishing from a boat, on the shoreline, or in freshwater, opportunities abound for all anglers. Marine boat anglers can access the fishery from any of the various boat launches and harbors that are conveniently dispersed throughout Ketchikan’s road system; many of which offer boat rentals. Fishing hot spots on the north end include Indian Point, Bushy Point, Clover Pass, Pup Island to Tatoosh Rocks, Survey Point, Camano Point, Vallenar, and the backside of Gravina Island. On the south end, your best chances of success are at Mountain Point, Herring Cove, Dall Head, Alava Point, Mary and Percy, Ship and Skin islands. If boating isn’t your forte, there are also numerous commercial outfits that would be happy to take you fishing. For our shoreline anglers the best coho spots can be found at Herring Cove (be sure to check your tide book) and the shoreline of Mountain Point. These intrepid anglers can be seen casting from the rocky beaches using a variety of gear including spinners, spoons, herring, cured eggs, and flies to try to get a bite. As October approaches, the fishing fun continues as coho move into freshwater streams. Freshwater anglers along the road system have good success at Ward, Ketchikan, and Herring Cove creeks. Anglers looking for a remote fishing experience can chase after fall coho in Fish Creek, McDonald Lake and the Naha River drainages or on the Wilson and Blossom rivers. For more information about fishing opportunities near you, stop by your local Alaska Department of Fish and Game - Division of Sport Fish office or visit our website to learn about fishing around Ketchikan. Autumn is starting to arrive in Southcentral Alaska. Not only is there is a crispness and coolness to the air these days, but sunrises are later, and sunsets are earlier, and the leaves are starting to fade from green to yellow. 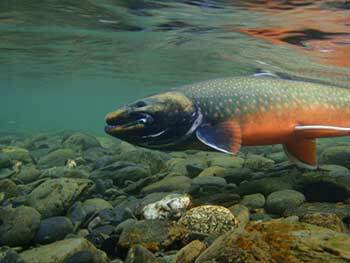 September provides ample opportunities for rainbow and steelhead trout, and Dolly Varden fishing. If you haven’t fished for rainbow and steelhead trout in the fall than this is the perfect opportunity to fall in love with another type of fishing during this transition period from summer to winter when ice fishing season begins. As the spawning season progresses for sockeye and coho salmon, the Kenai, Anchor, and Ninilchik rivers and Deep Creek provide anglers plenty of chances to fish for rainbow and steelhead trout, and Dolly Varden. These fish are feeding on salmon eggs and the carcasses of salmon that have died off. Anglers can be caught fishing egg patterns behind spawning salmon or flesh colored flies in ginger and two-tones pink and orangish hues. Bring a variety of bead and fly colors with you when fishing so you can change your set-up if the fish aren’t biting. 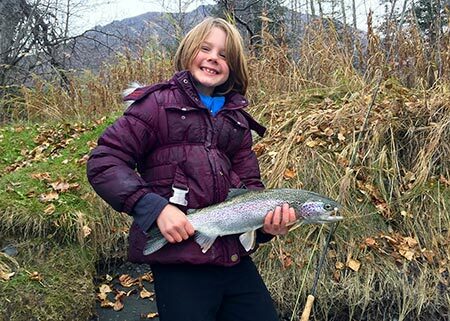 Anglers can also head north and fish for rainbow trout, Dolly Varden, and Arctic grayling at numerous Palmer Highway streams such as Willow, Little Willow, Kashwitna, Sheep, Caswell, and Montana creeks and the Talkeetna River. Make sure you know the sport fishing regulations for the waters you are fishing. Fall is also a great time to fish the locally stocked lakes. The cooler temperatures and recent rains are cooling lakes off and fish are becoming more active and feeding in shallower waters. Lake fishing can provide that feeling of solidarity and tranquility after a long summer of combat fishing. Anglers are encouraged to cast small lures or wet flies near weed beds or drop offs. Bait under a bobber is also a good option. Surface feeding trout have been spotted on most Anchorage lakes, so fly anglers should make sure to carry dry flies with them whenever they are fishing. Black leeches and bead-head nymphs are alternative options as well. For more information about fishing opportunities near you, stop by your local Alaska Department of Fish and Game - Division of Sport Fish office or visit our website to learn about fishing around Southcentral Alaska. There is still time to get in some fishing before ice-up. Quartz Lake is stocked with Arctic char, king salmon, rainbow trout, and coho salmon. This 1500-acre lake has two distinct basins. Fishing from shore or dock is possible, but the best fishing can be had from a boat or canoe. Quartz is a very productive lake and grows fish rather quickly, so it is possible to catch nice-sized fish. Try using shrimp, salmon eggs, or spinners. The daily bag and possession limit is 10 in combination of species, only one may be over 18 inches in length. Quartz Lake State Recreation Area has 16 campsites in the loop and 87 parking/camping sites in the parking lot development. Facilities also include picnic sites, a picnic shelter, swimming area, two boat launches, and a handicap accessible fishing dock. A commercial business operates a boat rental operation in the park. There are some nice hiking trails on the complex for when the fishing is slow. There are two public use cabins for rent on Quartz Lake. How to get there: at mile 277.8 Richardson Highway, turn East on Quartz Lake Road. Travel 2.7 miles to the lake. For more information about fishing opportunities near you, stop by your local Alaska Department of Fish and Game - Division of Sport Fish office or visit our website to learn about fishing in the Tanana River Management Area. Nothing beats a hearty chowder as the fall temperatures start to cool. Check out this mouth-watering recipe from our friends at the Alaska Seafood Marketing Institute.